The Explorer of the Seas has sustained a bit of damage during a storm, although the Royal Caribbean has said it does not affect the safety of the cruise ship. A large wave smashed into Explorer of the Seas and hit its lifeboats, where one sustained some damage, but seeing as though new cruise ships have more than enough lifeboats, there is still enough for all passengers and crew. According to Royal Caribbean Blog a huge wave that measured around 40 feet hit the lifeboats on deck four, which you can see an image of above. We would imagine that these passengers were scared when sailing through those rough waters, although it is to be expected at this time of year in certain regions. We do love a good cruise, but there are areas where we tend to stay away from, choosing to go places where the waters are calmer. There are no reports of injuries and the ship has continued on its normal course. The world’s largest cruise ship operator Carnival Corporation & plc said it would increase fleet capacity by nearly 10 percent from 2014 through 2016, fueled largely by the addition of four new ships across four brands in less than 18 months. This week, Carnival Corporation is christening two new ships in the span of three days as its Princess and Costa brands host official naming ceremonies for Regal Princess and Costa Diadema, the latest new vessels to join the company’s fleet of more than 100 ships across nine cruise brands. Additionally, in 2015, the company’s P&O Cruises UK and AIDA brands will each debut a new ship, giving Carnival Corporation a total of four new ship additions by October of next year. In addition, Carnival Corporation continues to expand its upgrades and refurbishments to existing ships. In 2015, the company plans upgrades or refurbishments on 17 ships across six of its brands. The 2015 refurbishment plans include two former Holland America Line ships transferred to P&O Cruises Australia that will undergo complete refurbishment before sailing as Pacific Aria and Pacific Eden starting in November 2015. The renovated ships will be tailored for Australian and New Zealand passengers. Carnival Corporation’s four new fleet additions in 18 months are part of the company’s plan to introduce nine new ships across seven of its brands between 2014 and 2017. AIDA, Carnival Cruise Lines, Costa Cruises, Holland America Line, P&O Cruises UK, Princess Cruises and Seabourn are all expected to debut new cruise ships between now and the early part of 2017. In 2016, Carnival Cruise Lines will debut Carnival Vista, a 133,500-ton ship that will be the largest ever in its fleet — with the ship being unveiled in a sneak preview in New York in January 2015. Holland America Line will launch its newest ship, the 99,500-ton ms Koningsdam, a new Pinnacle Class ship that can carry 2,650 passengers. Also in 2016, AIDA will introduce a new sister ship to the 2015 AIDAprima with capacity for 3,250 passengers, while Seabourn will unveil its newest luxury ship, expected to be the biggest ever built by the brand with the ability to serve 604 passengers. Looking forward to 2017, Princess Cruises is working with Italian shipbuilder Fincantieri to build a 143,000-ton vessel featuring the highly popular design elements introduced by the brand’s two newest ships, and sisters, the Royal Princess and sisters, the Royal Princess and Regal Princess. 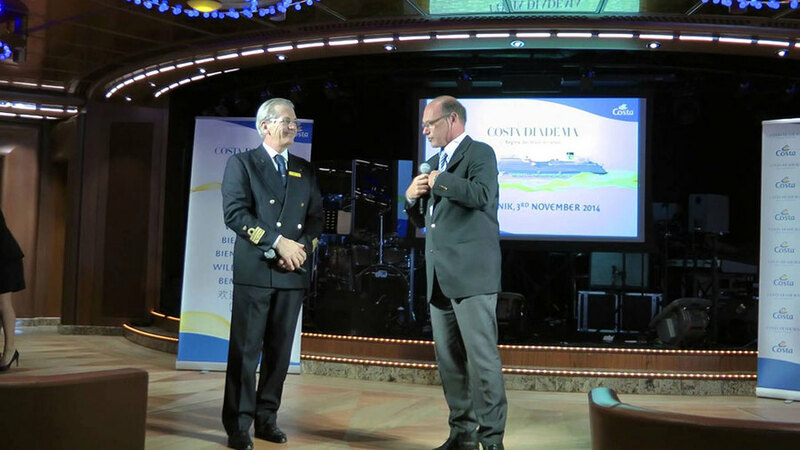 Costa Cruises has officially christened its new flagship cruise liner Costa Diadema, which is worth $688 million (£433 million). On November 7th, at Ponte dei Mille in Genoa’s historic maritime station, the ship was officially named and the ceremony began with a parade of the godmother – Italian travel agent Carolina Miceli – and her international maids of honour, who represented Germany, France, Spain and China. Cardinal Angelo Bagnasco, who is the archbishop of Genoa and president of the Italian Episcopal Conference, blessed the ship while Ms Miceli named the vessel and helped to cut the ribbon to start the celebrations. A three-litre jeroboam of Ferrari Gran Cuvee Trentodoc spumante was opened on the bow of the ship to get proceedings off with a bang. Fireworks and a light show made impressive viewing outside, while inside there was a gala dinner that had a special menu created by Michelin-star chef Fabio Cucchelli. until the 2015 summer Mediterranean season comes to an end. 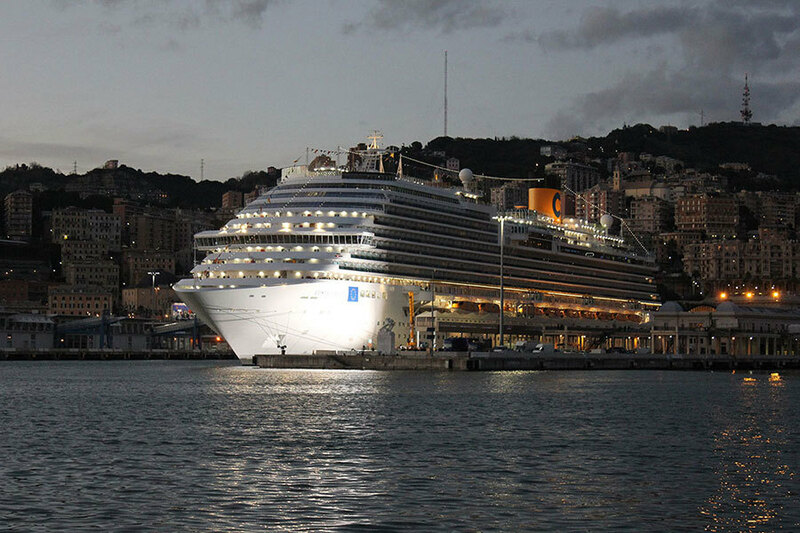 It will take passengers on seven-night cruises that call at Marseille, Barcelona, Palma de Mallorca, Naples and La Spezia. The vessel weighs 132,500 tonnes, and is more than 300 m long and 37 m wide, making it quite the force to be reckoned with. Inside, there are 1,862 guest cabins and it is hoped that the view over the sea will remind viewers of an Italian resort. In terms of relaxation facilities on board the Costa Diadema, there’s an arcade with interactive games, a three-level spa and a 500 m open-air promenade that contains restaurants, bars and cabanas. Evening entertainment consists of the new shipboard production show Sapori d’Italia (Flavours of Italy), where a range of songs from the last 100 years will be performed by 18-year-old baritone Simone Baldazzi, acrobats Celia and Julian and the Phly Boyz. What’s more, the masked party La Notte in Maschera finishes off the night-time programme of events. More than 1,000 shipyard workers helped to build the vessel, along with 2,500 subcontractors and 400 Italian interior suppliers from Fincantieri’s Marghera yard.